The P42DC (GENESIS Series I) is the successor model to the P40DC. It has an engine output of 4,250 horsepower(3,170 kW) at 1047 rpm, or 3,550 horsepower (2,650 kW) when running in HEP mode (900 rpm) with a 0 kW HEP load. 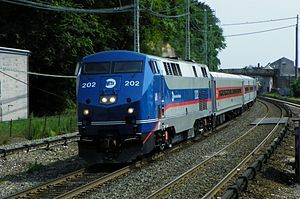 Traction horsepower in HEP mode decreases to a bare minimum of 2,525 horsepower (1,880 kW) when providing the full 800 kW HEP load to the train.